I’ve wrote my initial thoughts on Wii Fit in May just after I got it but since I’ve had it several months now, I wanted to give an extended review. I initially reported that it was hard to get a copy of Wii Fit because it was sold out everywhere. I had to go to a Woolworths across town, and at the time I remarked that Wii Fit is “so well designed that you can start getting fit before you even get home and set it up”. The box is pretty heavy. Why a pair of bathroom scales is so heavy I don’t know. There is a video on the Nintendo Channel discussing how the Wii Fit board was designed and manufactured. Since then, the stock shortages seem to have eased up a bit so you shouldn’t have problems getting hold of a copy. So the basics. Wii Fit consists of two parts: a body test that you take daily which measures your weight and balance and a series of “games”. You’re supposed to take the body test every day around the same time and it plots your progress against your time. It also gives you a “Wii Fit Age”. Mine has fluctuated between 18 and 30 on different days so you definitely shouldn’t read too much into the results from any one particular day. Aerobic Exercise: Boxing, hula hooping, jogging, etc. Balance Games: Ski jumping, Skiing and snowboarding slaloms, tightrope walking, etc. As you progress through the game and do more exercises, new levels and new games are unlocked for you to play. Highlights for me include rhythm boxing, where you throw punches and dodges in time to a rhythm. In bubble balance, you’re inside a bubble and need to navigate your way downstream without bursting the bubble by colliding with the river bank. Hula hooping is a really good laugh to play when friends are around although you’ll have to trust them not to record a video and to post it onto Youtube. The 10 minute version “Super Hula Hoop” is very challenging! There’s an odd one called “Zazen“ which looks like some kind of Buddhist meditation exercise. Wii Fit still gives you “exercise minutes” for it so it’s kind of a loophole for working your way up to your 30 minutes without doing any work. For each activity, there is also a “high score board” where you can compare your scores against those of your family. 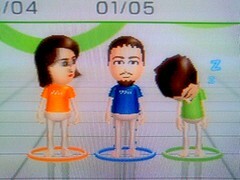 This is another great feature of Wii Fit and encourages you to be competitive and work a lot harder. So what’s the overall verdict? Is Wii Fit good fun? Definitely yes. It’s better than Wii Sports and it’s my favourite Wii game to date. It is pricier than most games but you get the Balance Board with the game. Have I done more exercise since getting Wii Fit? Yep. But nowhere near the 30 minutes a day – probably only once a week or so. The exercises can get a bit boring after a while and I just personally find it very difficult to find time. Wii Fit gets a “strongly recommended” rating. 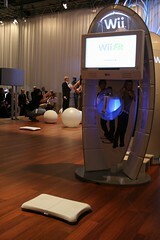 More Reviews of Wii Fit at TestFreaks.co.uk. This entry was posted in Games, Reviews by Ken. Bookmark the permalink.